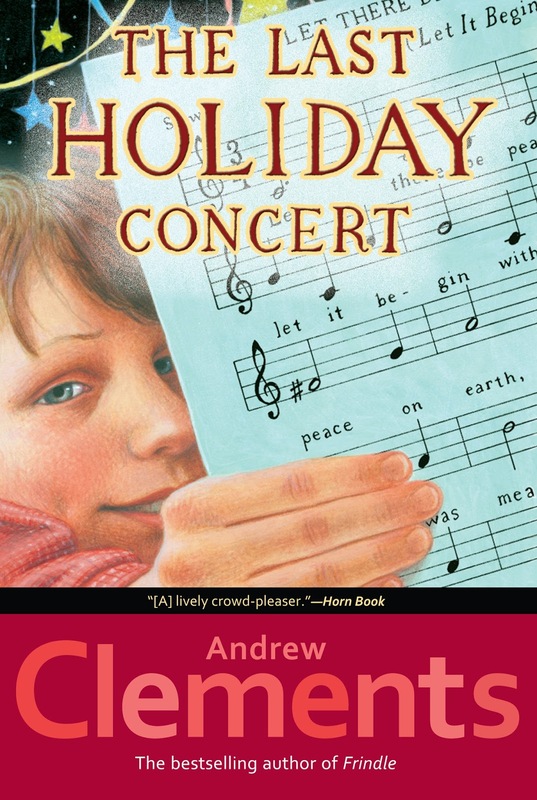 The Last Holiday Concert is a heartwarming holiday tale by Andrew Clements. Like his other books, this is a school story, and the focus is on that yearly tradition well known to so many families with elementary school kids: the holiday concert. Mr. Meinert, the music teacher at Palmer Intermediate School has lost his job due to budget cuts. His students, including popular sixth grader, Hart Evans, aren't aware that they'll be losing their choral director, however, so for them it's business as usual. They don't take chorus - or their upcoming holiday concert - seriously at all. Hart even goes so far as to amuse himself during rehearsal by shooting a rubber band at the ceiling. When he hits Mr. Meinert, however, things take a surprising turn. Next thing he knows, Hart is in charge of the holiday concert, and it's up to him whether the sixth grade chorus will sink or swim in front of its audience. Before this year, the only Andrew Clements book I had read was Frindle. This year, I added No Talking, Troublemaker, The Landry News, and About Average to my list, and it has been a real pleasure getting to know an author who writes such wonderful realistic school stories. The Last Holiday Concert combines a lot of the signature elements I have come to associate with Clements's work. The story provides the point of view of the main child character as well as of some of the key adults in his life. Family scenes appear now and then, when necessary to the plot, but most of the action takes place within the school setting and focuses on Hart's relationship with Mr. Meinert. Though putting a student completely in charge of a holiday concert seems like an unlikely thing for a teacher to do, Clements makes it really plausible by putting so much realism into the book. Hart and his classmates behave as real kids do, and Mr. Meinert's thoughts and actions humanize him as something more than just that strict chorus teacher the kids don't really like. As in his other books, Clements promotes change in his main character by taking him out of his comfort zone and presenting him with a true challenge. The ending of the story is definitely heartfelt, and the way Clements describes the kids' concert is dramatic enough to bring a few tears to the eyes of the reader, especially if that reader is an adult who works with kids. This is a bit of a spoiler, only in the sense that I'm telling you something that doesn't happen, but I was pleased to see that the story's happy ending didn't tie up every loose end. Mr. Meinert never gets his job back. Hart makes a difference, for himself, and for Mr. Meinert, but Clements keeps us grounded in reality by avoiding that It's a Wonderful Life - esque ending, and the book is stronger for it. The Last Holiday Concert is not just a Christmas story, and the events of the story closely mirror holiday celebrations at many public elementary schools, so this would be a good non-denominational read-aloud for diverse elementary school classes. Those who have also read Clements's The Landry News will note some parallels between Hart's experiences with Mr. Meinert and Cara's with Mr. Larson - it might be interesting to compare and contrast the two relationships to understand better how Clements builds his stories. Whatever the time of year, and whatever the subject matter, you truly can't wrong with a novel by Andrew Clements.